There are only a couple of days to go before the grand festivities embark upon the City of Joy aka Kolkata. Pandal hopping is a big part of the puja merriment. Viewing the magnificently lit pandals, with artistic idols and thematic decorations brings a joy to all. Though, Durga Puja is celebrated with great pomp and grandeur all over West Bengal, but Kolkata being the biggest city, is always a crowd puller. Millions of people leave their homes with an intention of viewing the popular pandals in the city. With only a couple of days to go, people of Bengal are busy making their last minute arrangements. It is a tradition of wearing new clothes on all five days of the Durga Puja. Thus, shopping is an inevitable part of the celebration too. And at times, the busy going schedule of the people forces them to shop right at the last moment. If you are one who needs to purchase some fashion items or dresses at the last moment, then this weekend is the last opportunity. Kolkata Metro on their part has extended helping hand to all the commuters visiting the city for their last minute shopping needs. There will be 114 extra trains to accommodate the rush on this weekend. On Saturday, there will be 274 trains available for the commuters which are 50 more than the normal traffic. While on Sunday there will be 174 trains available, which means there will be 64 more trains available. 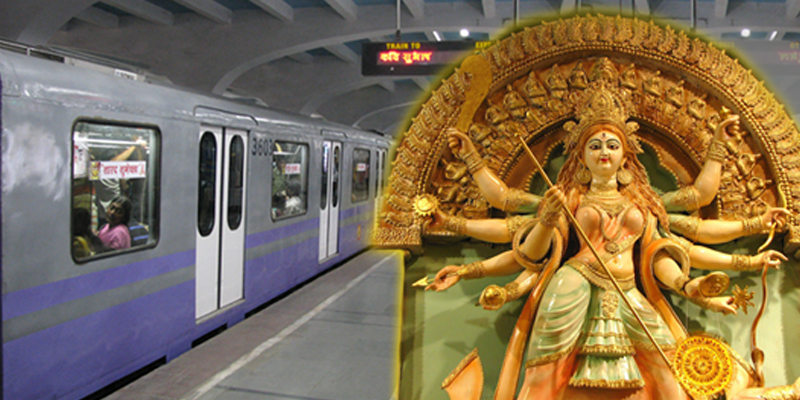 Apart from this, Kolkata Metro will run trains at higher frequency during the actual Durga Puja days (October 19-23). Metro services on these days will start at 1:40 PM and go on till wee hours of 4 AM. It is time to celebrate the arrival of Goddess Durga with fun and fervour.